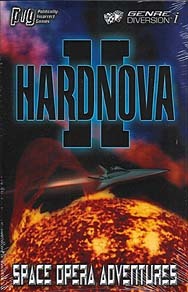 Hardnova II is a roleplaying game designed to be both easy to learn and fast-paced. Versatile rules make it perfect for one-shot games, extended play, or as a framework for your own ideas. The included setting can be easily discarded and replaced by that of your favourite movie, television program, comic, or novel. Requires two 6-sided dice. * Flexible and consistent (basic and advanced) rules for starships, robots, exotic abilities, aliens, and more. * Ready-to-use templates to get into the action quickly. Sixty templates for characters, aliens, starships, and robots. * Five ready-to-play episodic scenarios. Patrol the galaxy and battle pirates, vicious aliens, and unknown hazards. * Five ready-to-play one-shot scenarios perfect for last minute play or as a diversion from your other games.